The Pittsburgh Steelers will head into their last preseason game of 2015 at home, keeping most of their experienced players on the sidelines, giving guys still pushing for a roster spot the opportunity to show their level of commitment and understanding of the Steelers system. While the main focus will be on evaluation, three others will factor into this game against the Carolina Panthers. Head coach Mike Tomlin knows that the final preseason game, one that has been played against Carolina in the past few years, has historically helped determine the final roster for his team. Thursday’s game will be no different. Don’t add Tyler Murphy into any quarterback competition. The Steelers are looking at Murphy’s receiving skills instead. Tomlin admitted there is no question that Murphy has the athletic ability to play quarterback, but the team has watched him develop skills to make a full-time change. Murphy has been given the room to make a conscious decision to switch to wide receiver full time, something Tomlin says he has embraced. It is safe to assume, based on what Tomlin has said about the number of experienced players who will be on the field, that the focus will be on several players fighting for key roster positions on the defense. In the defensive backfield, a few names float to the top. Free safety Gerod Holliman stepped out of the seventh round of the 2015 draft and into relative obscurity. His performance, or lack thereof, has not been a good representation of a Thorpe award winner who recorded 14 interceptions in 2014 with Louisville. With only three tackles in the preseason, Holliman needs a breakout performance to show why he should be anything more than a practice squad guy this season. Alden Darby is in the mix at the position as well. With Mike Mitchell and Robert Golden looking like the go-to guys despite their own inconsistencies, Holliman and Darby need to make big plays that keep the eyes of coaches on them in a good way. As much as the safety position has been lackluster, the cornerbacks have had their fair share of scorching. That puts a target squarely on Kevin Fogg, Doran Grant and B.W. Webb. Other guys on the defensive side of the ball that will see plenty of much-needed time against Carolina ahead of final cuts include: Matt Conrath, Ethan Hemer, Mike Thornton, L.T. Walton, Anthony Chickillo, L.J. Fort, Shayon Green, Ross Ventrone and Jordan Dangerfield. The scariest part of figuring out who is going to be the ‘go-to’ guy at any position on the defense for the Steelers this year is the fact that even the players deemed “established” have yet to prove that they have guaranteed their position outside of a handful of players. That James Harrison is still outperforming Jarvis Jones and other outside linebackers says a ton about Harrison’s preparation time, workout regimen and experience but even more about the lack of those traits in his teammates. By now, it’s clear that even if they were to exhaust the NFL appeal process, Le’Veon Bell and Martavis Bryant are not going to be dressing in the Week One meeting with the New England Patriots – even if Tom Brady won his appeal. Like it or not, Pittsburgh needs the Carolina game to determine who will fill the gaps left by two of their top offensive performers in 2014. DeAngelo Williams has shown why he was a smart choice for the Steelers in the offseason, but behind him there are plenty of questions left unanswered about Dri Archer, Josh Harris and Jawon Chisholm. Between the three rushers, they have amassed a total of 107 yards in 43 attempts. Chisholm has the most carries with 21, but not one of the three has been able to get the ball into the end zone on the ground. In fact, the running game has been a bit of a disappointment in the preseason, with Williams scoring the only touchdown via rushing. At receiver, no one is unseating Antonio Brown or Markus Wheaton at this point. That leaves the job open to Murphy, Shakim Phillips, Sammie Coates to push for a spot that Darrius Heyward-Bey has demonstrated he is ready to handle. Murphy and Phillips are the two guys most on the bubble, which puts pressure on them to give outstanding performances against the Panthers whether it is Vick or Jones tossing the ball their direction. Every dropped ball will be a strike against them. How they create separation, run routes and press the Carolina defensive backs will be heavily analyzed on the sidelines. The Steelers have traditionally carried five receivers on the active roster. A poor performance may mean a spot on the practice squad or a trip out of the Steel City. 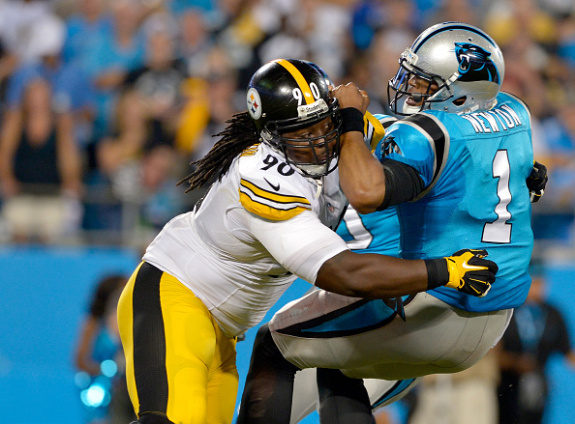 Be the first to comment on "Steelers: Four keys to last tuneup against Panthers"